Smoothies are a great way to start the day! I love making smoothies of all varieties, mixing it up with different fruits and greens. Today I made a blueberry smoothie that’s so easy to make. Berries are high in antioxidants, great for countering free radicals that are always being produced in our bodies as a result of living life! So eating lots of fresh fruits and vegetables high in antioxidants keeps us feeling and looking young and vibrant. For this raw food recipe, all you will need is a high-powered blender. 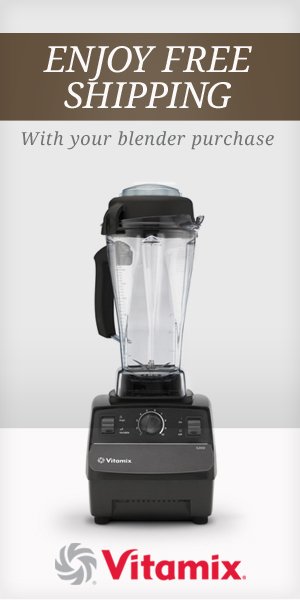 I recommend and personally use a Vitamix. It’s one of the top 4 essential raw food kitchen tools I recommend you stock your kitchen with. Base: When it comes to smoothies, you can make them as thick or liquid as you like. For the base of this smoothie, I used the water from 1 coconut. You can also use water. On a rare occasion I use nut milks as my base, but those are for more special occasions, like if I’m making a raw mango lassie. The reason I don’t tend to add nuts or seeds is because I prefer not to mix my fat with my fruit, it doesn’t make for the best food combination. 1 Tablespoon of maca powder. Maca is a potent superfood that grows in the high mountains of Peru and contains many health benefits. Maca root contains significant amounts of amino acids, carbohydrates, and minerals including calcium, phosphorous, zinc, magnesium, iron, as well as vitamins B1, B2, B12, C and E.
Have a wonderful day and enjoy the many benefits of raw living food!